Join us for A House Divided on Thursday June 7 at 5pm (C). Our guest is Kristopher Teters. He will talk with Bjorn Skaptason about Practical Liberators: Union Officers in the Western Theater During the Civil War. The book provides a, unprecedented look at the attitudes and convictions of Union Army officers about Emancipation as the Civil War progressed. During the first fifteen months of the Civil War, the policies and attitudes of Union officers toward emancipation in the western theater were, at best, inconsistent and fraught with internal strains. But after Congress passed the Second Confiscation Act in 1862, army policy became mostly consistent in its support of liberating the slaves in general, in spite of Union army officers’ differences of opinion. By 1863 and the final Emancipation Proclamation, the army had transformed into the key force for instituting emancipation in the West. However, Kristopher Teters argues that the guiding principles behind this development in attitudes and policy were a result of military necessity and pragmatic strategies, rather than an effort to enact racial equality. Through extensive research in the letters and diaries of western Union officers, Teters demonstrates how practical considerations drove both the attitudes and policies of Union officers regarding emancipation. Officers primarily embraced emancipation and the use of black soldiers because they believed both policies would help them win the war and save the Union, but their views on race actually changed very little. In the end, however, despite its practical bent, Teters argues, the Union army was instrumental in bringing freedom to the slaves. The following day, June 8 at 3:30pm (C), Michael Burlingame joins us to talk about Sixteenth President-in-Waiting. This book examines the three months between Lincoln’s election and inauguration through the impressions of full-time journalist, Henry Villard. Burlingame has collected all of his dispatches in one insightful and informative volume. Also available is Burlingame’s Abraham Lincoln: A Life. affectionately labeled “The Green Monster,” this two-volume, slipcased set offers a fresh look at the life of one of Americas greatest presidents. Incorporating the field notes of earlier biographers, along with decades of research in multiple manuscript archives and long-neglected newspapers, this remarkable work will both alter and reinforce current understanding of Americas sixteenth president. Order Your Signed Books Today! We’ll ship them right after the show. 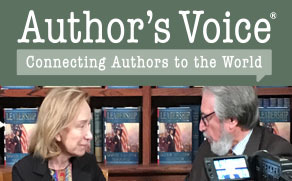 Remember to watch at AuthorsVoice.net or Live at our Facebook page!